The holiday season is in full force once November arrives…and logically, the holiday spirit should have us all in a great mood. Right? Not always. In fact, while the holidays are a cheerful time for many people, they can also be a very sad, lonely, anxious or depressing time for others. That can be the case for a variety of reasons, including the recent death or loss of a loved one or some other life-altering change. Let’s take a look at the issue and what you can do if you’re affected by depression during the holiday season. When you see the holidays depicted on TV, you see plenty of seasonal décor, yummy goodies, gift-giving, family togetherness and happy events. But that’s not always the reality — in fact, it usually isn’t. That’s a sanitized version of what happens for most families during the Thanksgiving and Christmas holidays. The reality may instead be stressful, tiring and filled with unrealistic expectations, which can all set a person up for sadness and even depression. And for those who consistently battle against anxiety or depression, the holiday rush may simply add to the chaos and their mental health battle. The holidays can be particularly rough for those who aren’t surrounded by family and friends. This time of year is typically seen as one where you embrace your loved ones — and if there are no loved ones around, that can be challenging. 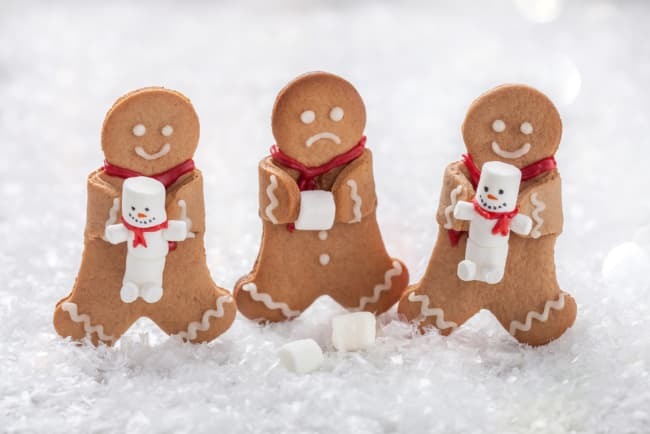 So now that we’ve established that stress, unrealistic expectations and even loneliness can all contribute to holiday depression, what can you do to protect your mental health as the year draws to a close? We have a few tips. When you’re in the midst of the holiday season, you can be depressed and not even realize it. Depression manifests itself differently in every person, so what you think of as “depression” may not be your reality. When you’re overwhelmed, you may find yourself experiencing extreme fatigue, headaches, sleep issues, excessive drinking or overeating. All of those can be signs of depression — as can the more commonly recognized sadness. If you find yourself experiencing these symptoms, talk with your doctor about what you’re feeling. He or she will likely have some suggestions for lifestyle changes you can put into place or even prescribe medication to help combat depression or anxiety. Schedule in some me-time. That may sound cliché, but it’s super important. You need to plan ahead and incorporate regular time to relax and restore yourself during the chaos of the holidays. What you do during that time is entirely up to you — choose something that’s calming to your soul. Keep your expectations realistic. This may be the hardest part of the holiday season, and it’s a major contributor of holiday depression. Everywhere you look during November and December, you see images of perfection, from Hallmark movies to newspaper ads. But perfection is not the reality. Decide on a few traditions that are musts for your family, and then realize that perfection is not the object, joy is. Enjoy yourself and do what you want to do, not what others expect you to do. Pace yourself. We talked about this above, but pick a few things you want to do this holiday season. It is impossible to do everything, and trying to do everything is one way to end up fatigued, overwhelmed and stressed. Know your limits — and create boundaries for yourself and others. It is perfectly fine to say no. Get plenty of sleep. Ideally, you should be getting between seven and nine hours of sleep every day, year-round. But if you don’t usually, now’s the time to really prioritize your sleep. Set a consistent bedtime and wake time, and stick with it for best results. Don’t push aside your feelings. If you’re experiencing grief, loss, sadness, anxiety or any other feelings, don’t hide them. Talk with your family, your friends and your doctor about what’s going on. They can’t help you if they don’t know! Think you could be experiencing holiday depression? Talk with your doctor. Need a doctor? Find one here. Would you recognize the signs of depression?